If they know the bike ain't right, why ride it? The Grand Tours are upon us, and with these big tours comes the attention to fine details that can make or break a GC contender. The time trial stages deserve special attention this year because the 2010 Giro d' Italia has 3 individual time trials and 1 team time trial. That means that during 19% of the stages a rider will be on a time trial bike. The ability to time trial well can define a winner. A winner can be defined by his bike, or should we say confined by his bike. Let's start with the facts: Technical Guideline (Rules) from UCI Technical Regulations for Bicycle a Practical Guide to Implementation. The technical regulations for bicycles, (standards for road bike design) have been in place by the UCI since 2000. The most updated version of the regulations on the UCI website is dated February 4, 2010. However, as is always the case, people make the difference. Last year Georges-Emmanuel Denjean took over as Technical Director at UCI. It is his efforts that had started the panic over the design of time trial bikes. Many bike manufacturing companies have a clear intent to build a standout race winning bike utilizing their latest engineering designs and development. Their goal is to build their brand name by building a bike for the professional cyclist that will win races, look fast, and deliver the illusion to the common man that he too can ride a bike just like Cancellara. Sadly when technical advances, consumerism, and personal agendas come to a juncture it often takes time to shake out. It now looks like perhaps the bike manufacturers are winning. As we head into the Giro d'Italia 2010, the pro cycling teams most affected by the design of bikes outside of the allowed frame design include Saxo Bank, Astana, Milram, Garmin-Transitions, Lampre, Rabobank, Footon-Servetto. We could possibly see these teams on modified versions of their own sponsored bikes, (this is when the paint specialists are called in). The teams will arrive with the shiv bikes in their line up. Although they risk the chance of last minute changes of equipment - always a panic situation for mechanics and riders. This latest panic was driven by the desire of the UCI (and it's employees) to continue their efforts to apply consistency and permanence to UCI rules by enforcing and communicating the rules prior to race day. We may find that the manufacturers continue to create the drama by pushing the limits and the teams go along looking for the added advantage. 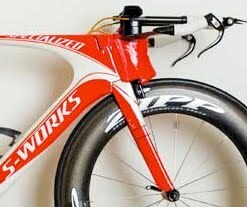 Trek will introduce their new TT bike at the 2010 Tour de California, this bike is of course available to the consumer. Are these regulations needed? well, that's an entirely separate question. *Post Post Note: Astana rode the Specialized Shiv bike in the TTT in the 2010 Giro d' Italia. 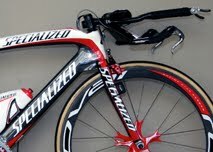 The Specialized Shiv Bikes, the Giant Trinity Advanced SL and a (new to the public) Trek Time Trial Model was introduced at the Tour of California in May 2010. Other than weighing the bikes before approaching the start ramp, I did not witness any other measuring of the bikes. 2011 Update: the shiv bike was used widely by HTC-highroad, Sao Bank-Sungard, and Astana in 2010 and 2011.